A few words about our village: Located on the coast 15 kms Roanne Roanne, 1h30 from St Etienne, Lyon and Clermont Ferrand, Saint haon chattel occupies a rocky outcrop on the Monts de la Madeleine and immerses visitors in more 10 centuries of history. We appreciate the architectural anthology offered our village by taking the route marked walls between hotels and private houses with wood sides and mansions. Saint haon chattel combined with charm, great environment, medieval and Renaissance heritage ambience with its church and ramparts of the XII century, the manor Fleure de Lys Hotel Pelletier, home of the sundial etc ... In our region flanne visitor enters historical walks, gourmet walks and wine tasting of the Roanne rating. A few words about our hotel: Located in Saint haon since May 2001, we opened our table in the only village café and at the request of our customers and work with and love our job, we moved our restaurant in December 2008 a house in the village offering our customers two dining rooms with a capacity of 70 seats + terrace of 40 seats that we do not désemplissons during the summer. 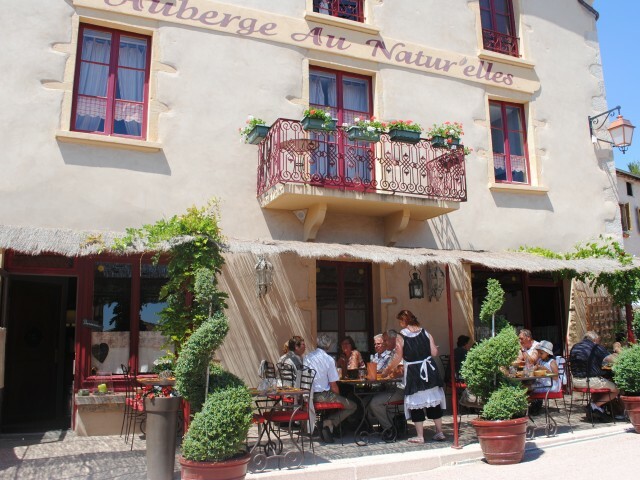 We offer our customers a traditional cuisine but also foreign and especially "Natur'elles" with local products. For the summer season, we are closed on Mondays. Week at noon we offer a daily menu at 13 euros and a summer menu, evening and weekend summer menu card + 1 + 1 frogs fisherman menu We can meet the demands of the group and leave a room available. Our house: Meanwhile, we took the last 2 years, the management of communal house (former rectory of the village) where we have 21 beds in dormitories or double room. We rent the night to 18 euros per night regardless of the option chosen. We are on the path of St Jacques de Compostela (Clunny, Puy) and propose a formula for Pilgrims 33 euros half board. Our pancake This year, we opened a creperie - salads in a Communal Cellar located in the walls of the ramparts and is in a beautiful garden open to the sky we offer sweet and savory crepes but also salads, sandwiches, quiches, deli, and at any hour of the day with a Sunday brunch. The pancake is open daily for the summer season except Tuesday.